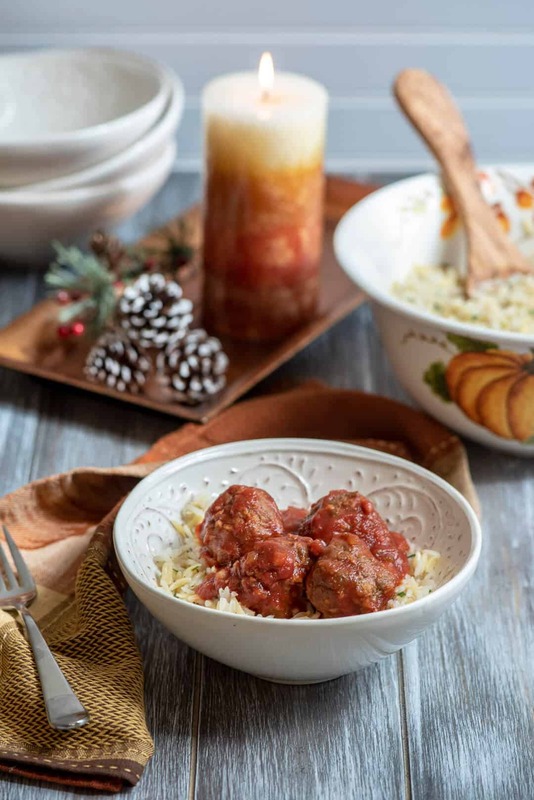 These easy, four-ingredient meatballs with a sweet and tangy tomato sauce are an excellent choice for a cozy weeknight dinner during this busy time of year. 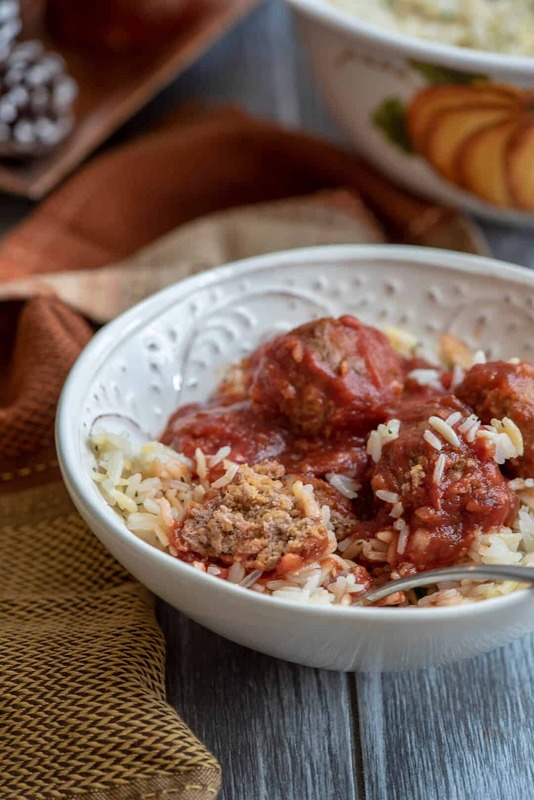 Good and Spicy Meatballs are delicious served over any variety of cooked rice or noodles. Well, here we are friends. Forging straight ahead into the holiday season. It’s the time of year to bulk up that collection of easy, go-to dinners you can pull off without a whole lot of planning or effort so we can spend less time fussing in the kitchen and more time with family and friends. That is going to be my plan. Be sure to check out the Kellogg’s® offer here – you can get a free pair of festive socks when you stock up on your favorite Kellogg’s® products for the holiday season at Safeway! Click below to learn more and save at your local retailer! 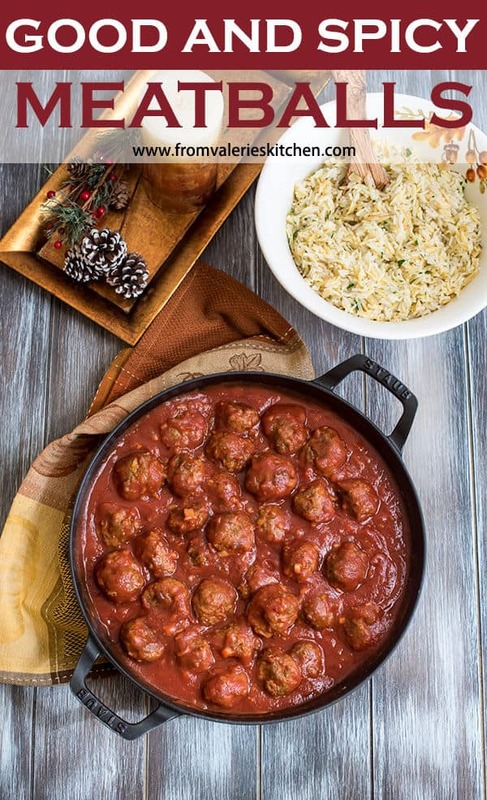 These tasty meatballs are seriously the easiest I’ve ever made. 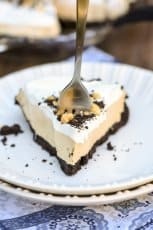 No slicing or dicing and just four ingredients, and I’m pretty sure that one of those ingredients may surprise you! 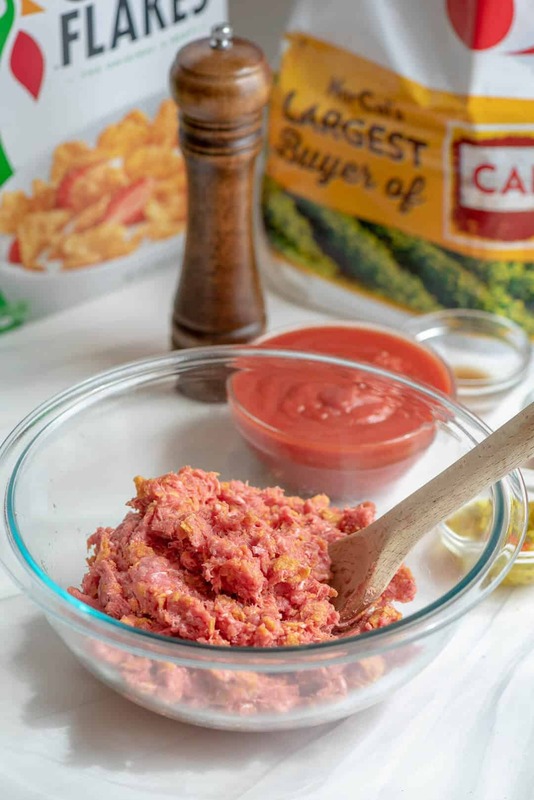 When Kellogg’s® reached out to see if I’d like to try a recipe from their collection, my choice was easy. Meatballs are always a popular choice in my house but it wasn’t just that. I was SO intrigued by the ingredient list that I just had to try them. 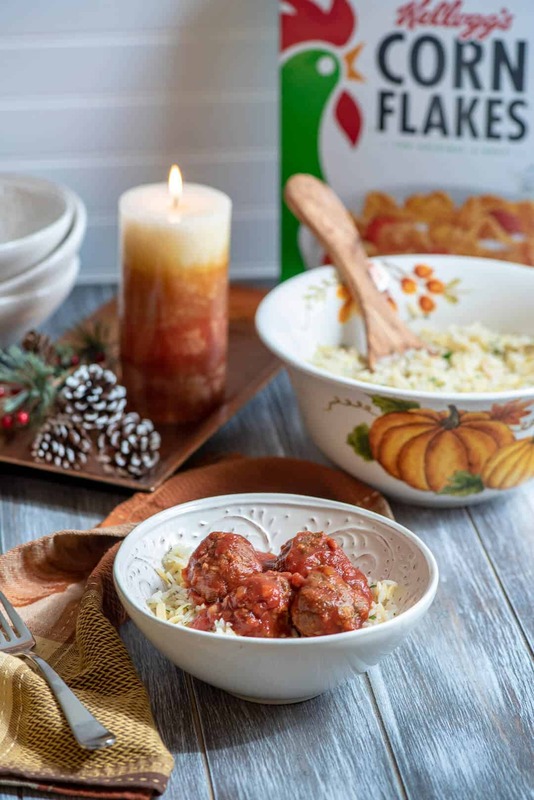 The recipe calls for Kellogg’s® Corn Flakes® in place of the typical bread crumbs you see in most meatball recipes, and I’m here to tell you that corn flake meatballs are pretty genius and absolutely delicious. 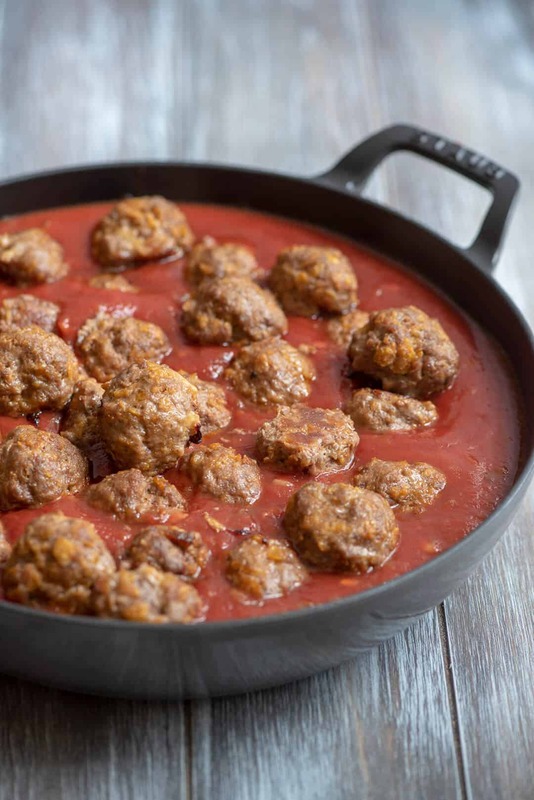 Don’t let the name fool you; the ingredients in the sauce give the meatballs a tangy kick, but they are not at all hot and spicy. This is a perfectly family-friendly dish. I cooked up a double batch for my big group and served them over my Almond Rice Pilaf. We all loved ’em. One of the best stress-reducers for me during this time of year is to have a well-stocked kitchen. Since Kellogg’s Corn Flakes are part of so many holiday recipes, they are always on my Safeway stock up list. 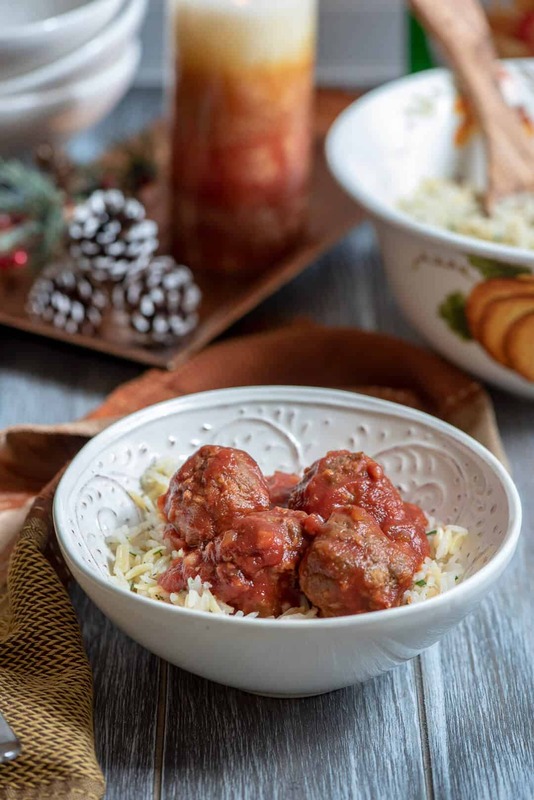 I use them as a topping on Grandma’s Special Hash Brown Casserole, a holiday tradition for us, and these meatballs are another great way to make use of an item that is so much more than a breakfast cereal – it’s an ingredient that helps to Make the Season Merrier. I was able to easily to pick up the Corn Flakes and everything else I needed for this recipe at my beloved local Safeway. No kidding. I love the place. Why? Because it is literally my second home. 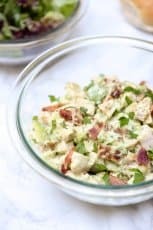 Between recipe development for my cookbook, this blog, and feeding my big family, I’m there most days. I’m sure we may all feel an affinity for our own local grocery store but I’m telling you, I sure love mine. From the fabulously stocked wine section (no surprise this is the first thing I listed! ), to the friendly checkers and baggers, to the deli, and the butchers who still provide the level of service I witnessed when I went grocery shopping with my Mom waaaaay back in time. They step out from behind the counter and walk over to see if I need help, and they know their stuff. I mean, where do you find that anymore??? 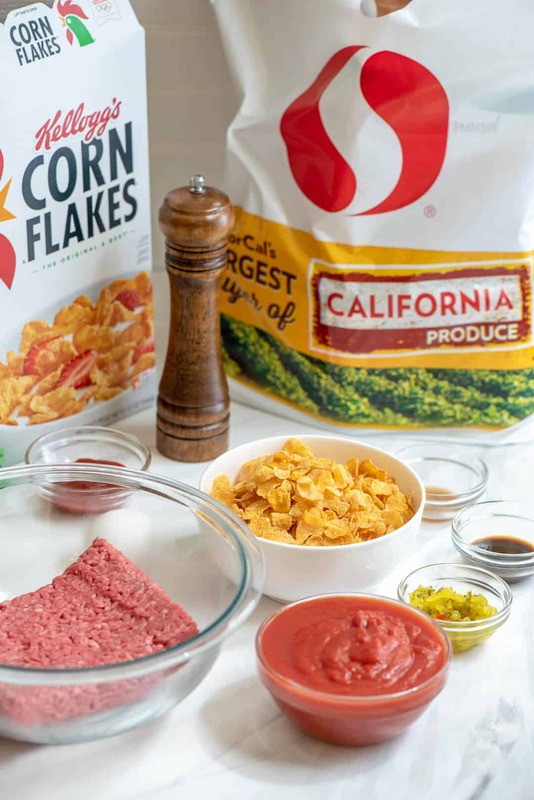 These four-ingredient meatballs include lean ground beef, Kellogg’s Corn Flakes, a little ketchup, and an egg. Easy, peasy. 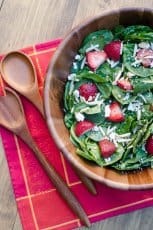 This recipe also includes a really interesting list of ingredients that creates and sweet, tangy sauce that people of all ages will love. 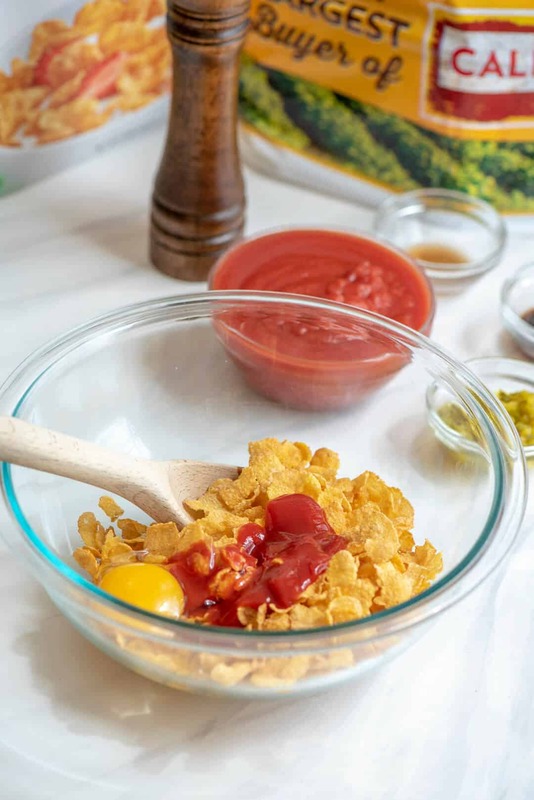 The Corn Flakes are combined with a couple of tablespoons of ketchup and an egg. The ground beef is stirred into the mixture until everything is well combined. 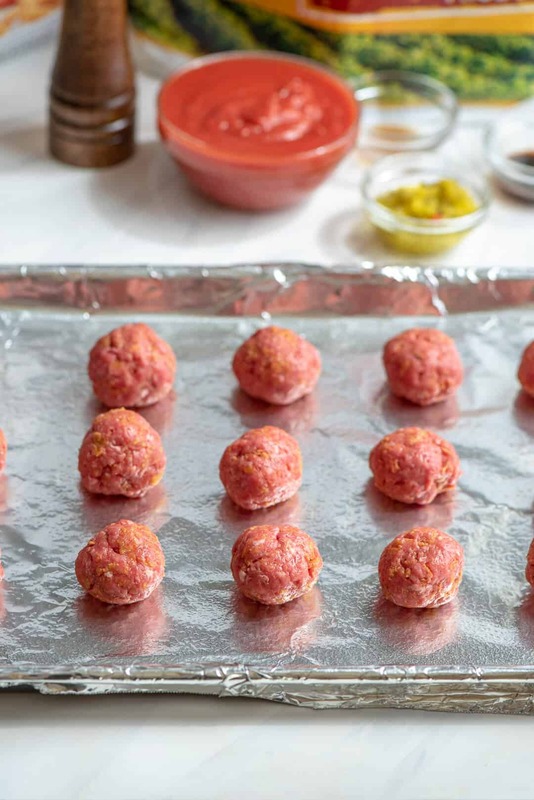 For easy cleanup, I like to bake my meatballs on a foil-lined baking sheet. Spray it with non-stick cooking spray so the meatballs will release easily after a quick turn in the oven. 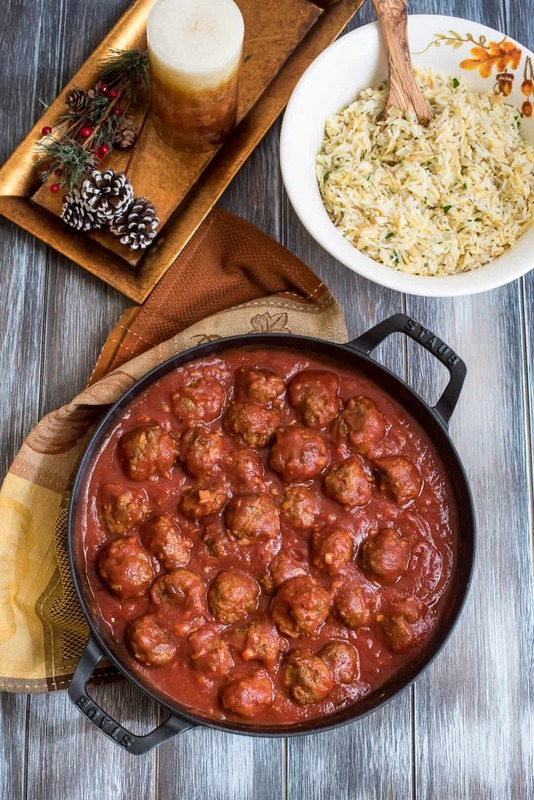 Drop the browned meatballs into the simmering sauce ingredients and let them simmer for an additional 15 minutes. Dinner is served! 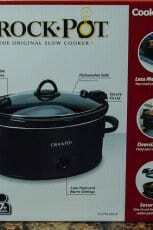 6 Quart Cook & Carry Crock-Pot Giveaway! 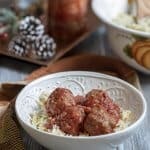 Love only 4 ingredients and my son LOVES meatballs. Can’t wait to try this! I hope you and your son love them, Mary!